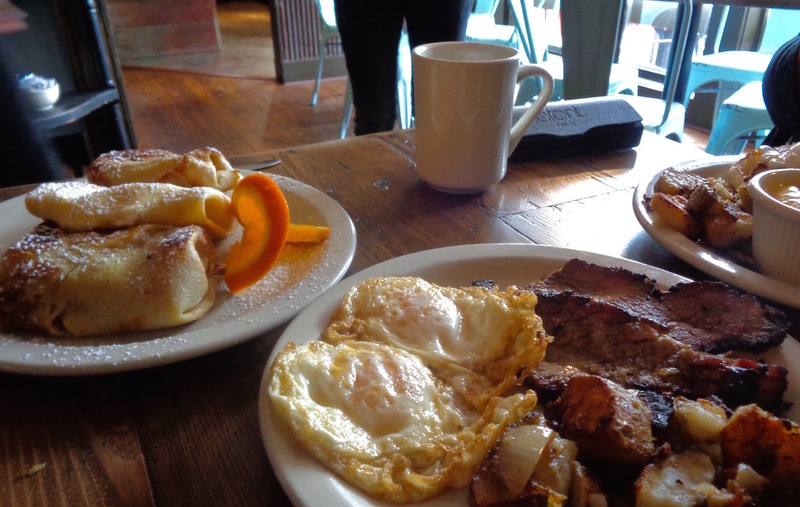 Brisket and eggs, with some blintzes in the background. When Marty’s Smoke Shack opened a few weeks ago at 110 S. Main St. in New Hope, many around town undoubtedly placed an exploratory visit to the new local barbecue joint on their spring itinerary. But when a small breakfast menu appeared in a display case out front, along with a note saying “served weekends,” our trip to Marty’s was moved up. While great barbecue is a blessing, a reliable, reasonable breakfast spot is a whole new ballgame, and Marty’s is a home run. Martin Hadicke (Fabulous Fest Catering in Stockton, N.J.) and Louis Zanias (Karla’s, Zubi, and Nina’s in New Hope/Doylestown) combined their talents to create Marty’s Smoke Shack. 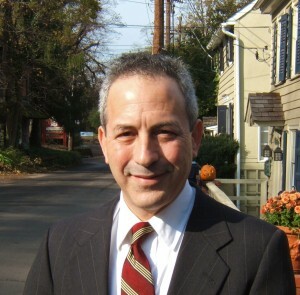 “We’re going to try to please a lot of different tastes,” said Hadicke in a February interview. At the core of the lunch/dinner menu lies the meaty trinity of brisket, ribs and pulled pork. The brisket is prepared Texas style, with what seemed a subtle rub, rather than the smokey-sweet Memphis-style sauce. Let’s be clear from the outset. If you grok brisket, drop what you’re doing, and go there now. Having squandered youthful years in dimly-lit brisket dens like Katz’s and Second Avenue Deli in Manhattan, this is simply the finest brisket available anywhere. Period. The flavor was savory, smokey, unctuous, and decadent, and its moistness never diminished, even after a spin on the breakfast grill. This is not your dad’s brisket, served tough as shoe leather and smothered in beef gravy or even mustard. The meat is substantial and has enough body to push back, only to crumble delicately like an ethereal delicatessen dream. But the madness of the Hadicke/Zanias team is in adapting smoked meats into a well-rounded breakfast offering in which they seem a natural fit. The brisket blows away traditional bacon or sausage as a breakfast accompaniment. Ours came alongside eggs, home fries, and toast, and was attacked as if by wolves. Order an extra side. 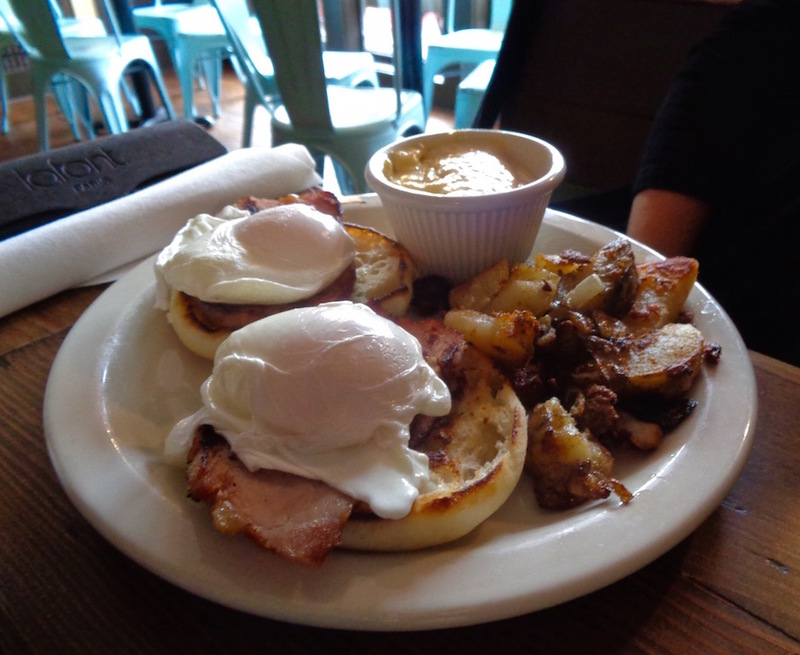 Even Eggs Benedict are outrageous due to the raucous house-cured Canadian bacon. Next on the over-the-top list are caramelized apple cheese blintzes. Dusted with sugar, and referred to as “stuffed crepes,” these rich, hedonistic treats would be more at home on Pitkin Avenue than the Avenue des Champs-Elysees, despite the French moniker. Another item not to be missed is the potato-crusted frittata with sausage and cheddar, served piping hot and crispy. 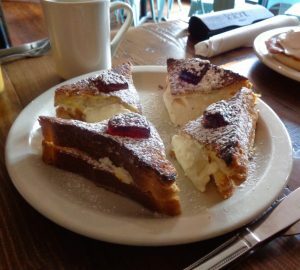 The cream cheese-stuffed French toast was topped with strawberry jam and vanilla bean sauce, yet was never too sweet or filling. Eggs Benedict are better than most around, and that may be due to house-cured Canadian bacon, but one can take it over the cliff by adding pulled pork and jalapeno. The rest of the offerings are diverse and solid, including an array of out-of-the-ordinary, three-egg omelettes. Even the pork roll side stands out, harkening back to the location’s former life as Zanias’ Cafe LuLu. The atmosphere was low-key and airy, yet warm, a cross between a French bistro and college coffee house. The service was flawless. No crowd, no pretension, and prices that seem reasonable, given the exceptional quality of the entire experience. A place where carnivores are king, but with a breakfast menu that’s welcoming to kids and vegetarians. Next week, a fresh batch of pastrami is expected, brined and smoked by Marty over the past couple of weeks. Pastrami. Also available on rye, with eggs, or perched atop an outrageous burger made with a blend of short rib and ground chuck. What’s not to like? Do me a favor, and don’t go to Marty’s Smoke Shack. Maybe it can be kept a secret for a little while longer. Thank you, you’re getting me hungry again!